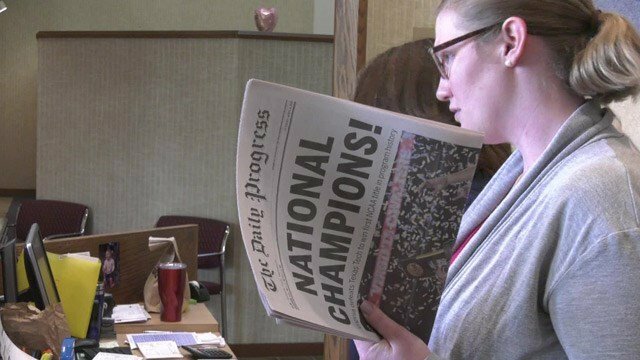 After running out of an extra 3,000 copies of the championship issue of UVA's NCAA championship, The Daily Progress is printing another 6,000. The Daily Progress is trying to keep up with the demand of its issue covering UVA's national basketball championship. ALBEMARLE COUNTY, Va. (WVIR) - Charlottesville community members are scrambling to own a piece of history, and a local newspaper can hardly keep up with demand. The Daily Progress is printing 6,000 additional copies of its issue featuring the 2019 NCAA Men’s Basketball national champion Virginia Cavaliers. The paper called for a print run of 3,000 extra copies on Tuesday due to the demand. After selling out again, The Daily Progress made the call for another 6,000 copies on Wednesday afternoon. The paper ordered an extra 6,000 copies of the championship issue on Wednesday afternoon. Copies of the paper can be purchased at the front desk of The Daily Progress at 685 Rio Road West or online. Extra copies featuring UVA’s other tournament wins are also available for purchase. The championship newspapers are going for $1.50 in person and $10 to be shipped. The front desk is open for 8 a.m. to 4 p.m. during the week. The Daily Progress is also selling a commemorative book encapsulating the Cavaliers&apos; 2018-19 season, title "The Road to Redemption." Plaques of the Final Four, Semi Final, and National Championship front pages are also for sale.